Social media is known for being a purveyor of false ideas and fake news. Unlike traditionally curated news and mainstream media, virtually anyone can post something to social media with little accountability. Pew Research Center reports that 68% of Americans polled said they occasionally get news from social media. 57% of Americans say they expect news on social media to be inaccurate. Despite the doubt, social media plays a role in shaping our views. If social media can shape how we think about the world, surely it has real consequences for humans but also for the environment and other species. Mongabay reported on a video of a ring tailed lemur (Lemur catta) that was released in 2016. The lemur was shown in Madagascar, sitting on the ground between two boys crouched next to it. The boys pet the lemur on the back. When the boys stopped, the lemur patted its back, as if it were asking to be petted. The video went viral in April 2016, as can be expected of videos showing cute animals. Researchers monitored responses to the video on Twitter and found that many people echoed the same sentiment: ‘I want a pet lemur’. 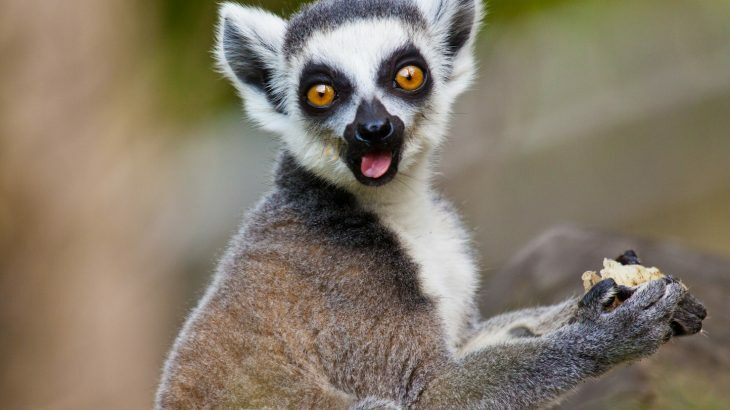 It’s unlikely that the vast majority of people responding to the video will actually act on a desire for a pet lemur, much less achieve that desire. But there is still concern that videos showing pet lemurs and other wild animals will have an indirect negative impact on lemurs, the environment or other wildlife species. I previously reported on how media can change human perception of endangered species. Research published in Plos One shows that people viewing photos of chimpanzees standing next to humans are 35.5% less likely to think of them as endangered, despite the fact that chimpanzees are endangered. Ring-tailed lemurs are endangered as well. Scientific American reports that two studies show Ring-tailed lemur populations to be between 2,000 and 2,400 individual animals. This is a 95% population decrease since the year 2000. There are now more ring-tailed lemurs in zoos than in the wild. One of the factors driving the decline of the iconic lemur is the illegal pet trade. Besides actually owning a pet, many tourists contribute to the captivity of animals as cheap attractions. Monkeys are used as tourist gimmicks in South America and Africa. People pay a few coins to get photographed with parrots on the beach in Mexico. These sorts of transactions are common. Often bushmeat markets dealing in the trade of illegal animal meat will sell more charismatic animals alive to be kept in captivity. Earth.com previously reported on Barbary Macaques (Macaca sylvanus), the only non-human primate native to Morocco and Algeria being used as props for photos with tourists. The macaques are highly endangered but still may end up chained and posing for 18 photos a day. Researchers surveyed tourists to Jemaa el-Fna, Morocco found that 88% of tourists weren’t happy with the monkey’s fate. Yet as the social media study shows, people may act differently online or when they’re not being directly questioned about their actions. Perhaps the full reality isn’t captured in a short video. Another primate, more related to the lemur than to monkeys, has suffered greatly from being a ‘cute’ tourist attraction and sometimes illegal pet. The Slow Loris (Nycticebus sp.) is indeed an adorable and nocturnal primate. It has giant round eyes common to nocturnal animals adapted to make the most of low light. The loris also has a blunt snout and little round ears on the sides of a furry face, and the overall impression is that of a living teddy bear with a prehensile tail. The slow loris is native to southeast Asia, including Java where it is known by a name that translates to ‘fire face’, a hint of something more sinister in the small primate’s nature. The slow loris is said to have a venomous bite in local folklore, thus the fire face is a reference to a burning sensation caused by a bite from the loris. Primatology.net reports that the venom of a slow loris is just a myth, saying there is no scientific evidence of venom from the slow loris’ bite. This isn’t quite true though. Mongabay reports that as of 2014 there have been two medically documented cases of slow loris venom. Obviously, two cases is far from a conclusive scientific study and a scientific consensus hasn’t been reached on the loris. Whether or not the bite of the little primate is actually toxic or not, the idea of a toxic bite is bad publicity for the loris. When captured for the pet or tourism trade, slow lorises generally suffer having their teeth cut out, to avoid them biting a handler. It goes without saying that getting teeth cut is excruciating and under the circumstances incredibly cruel. Many lorises don’t even survive the process of having teeth brutally cut from their head. Ignorance of the exotic pet trade and our use of endangered animals is widespread. Lady Gaga reportedly planned on having a slow loris in one of her music videos until it nipped her hand. Only 25% of those surveyed in Morocco were aware that the Barbary Macaques were endangered. As an anecdote, talking with most people, even those interested in the environment have no idea of the plight of Madagascar or its lemurs. Big roles in animated shows like Madagascar as well as bit parts on social media may play a role in this perception. People don’t seem to understand that just because an animal is a pet, a tourist attraction or a youtube star doesn’t mean the animal is doing well. This goes for both the population of a species overall as well as the treatment of an individual animal. In 2015, Scientific American reported that in three years, 28,000 lemurs have been captured for the illegal pet trade. This is in addition to animals captured for zoos or research. These lemurs are taken from a devastated but once beautiful home to be kept for the audience of a selfish owner. In a world of such brutality, we must ask ourselves, how much is a cute image worth in the face of a devastating reality?